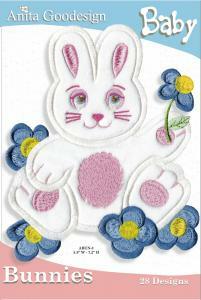 These sweet, fuzzy bunnies are hopping your way in time for spring and Easter projects. Of course, they are perfect for baby quilts, too! We all fell in love with their big bunny eyes and using "Minky" fabric for the applique makes certain they are touchable, loveable designs your family will enjoy all year long!